I've been meaning to play around with some new chocolate molds I bought, but I have been lazy and/or busy. Finally, after all this time, the weather cooled down just enough for me to feel in the mood to play with chocolate. I've been having MAJOR strawberry cravings and been eating basket after basket of them. They are buying quite a whole in my pocket since it is no longer strawberry season, but I love strawberries! They are my favorite fruit. So the first thing I did with some leftover strawberries? 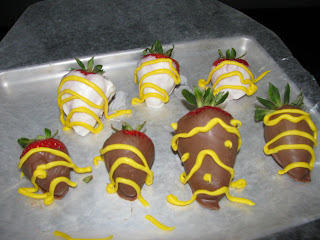 Quickly whipped up some milk chocolate and white chocolate covered strawberries! Yum! 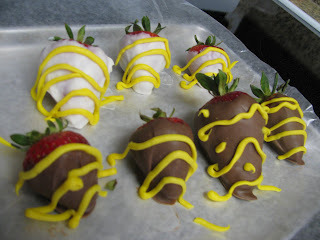 Also, since I had a tiny bit of yellow-tinted white chocolate left from another project (see below), I quickly (emphasizing on quickly) decorated the strawberries. Do you know how hard it is to pipe with very little chocolate left in a baggie? With the yellow, I got two reactions: my dad asked if I put cheese on my strawberries and my boyfriend asked if I put mustard. Lesson learned: don't use yellow on chocolate. I love flowers because they are a symbol of happiness. Flowers are also colorful and I love colorful things. 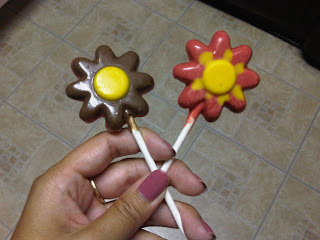 In general I think flowers are a waste of money because they die so quick, but hey, these chocolate flower lollipops won't die.... unless you eat them. Therefore, it's a win-win experience! I was too lazy to create more colored white chocolate so I just stuck with yellow, pink, and the normal brown milk chocolate. I'm not a fan of white chocolate (too sweet! ), but these are pretty yummy. I love chocolate that is soft, yet not melted. I love chocolates that just dissolves in your mouth... yum!